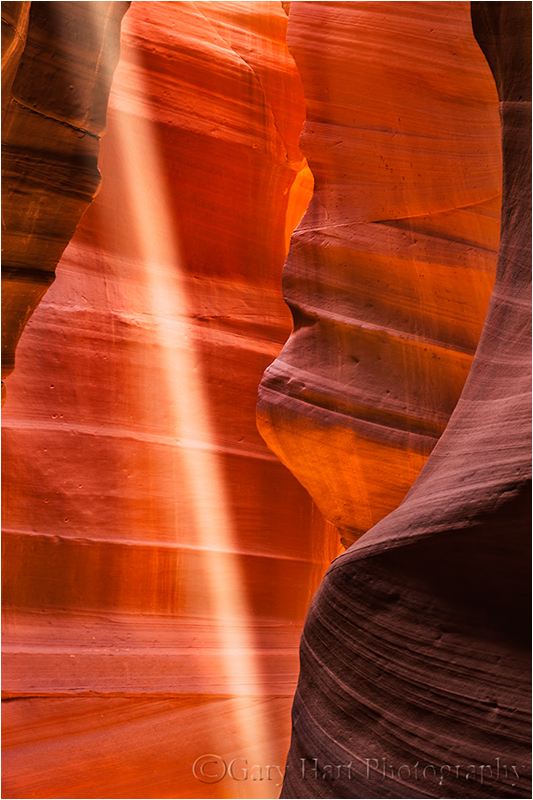 Upper Antelope Canyon near Page, Arizona, is known for its brilliant light shafts that seem to originate from heaven and streak laser-like through open air to spotlight the canyon’s red sandstone walls and dusty floor. Sometimes multiple shafts are visible, ranging from pencil thin to tree-trunk thick. The rare combination of conditions the shafts require include clear skies and the high sun angle only possible midday on the long side of the equinoxes. The shafts also require airborne dust—easily stirred by wind or footfall, but often augmented by the Navajo guides who carry plastic scoops to toss the powdery particles skyward. Photographers from around the world flock to Page each spring and summer, packing Upper Antelope Canyon like Manhattan subway commuters in hopes of capturing their version of this breathtaking phenomenon. Given the crowds, it would be an understatement to say that the experience isn’t as inspiring or peaceful as the photos make it appear. But it is mesmerizing, so much so that when the beams fire, it’s difficult to concentrate on anything else. And therein lies the rub—the color, curves, and lines that are Antelope Canyon’s essence are overpowered its most famous quality. The only way to get access to Upper Antelope Canyon is to join a tour led by a Navajo guide (I’ve never had a bad guide). The photo tour (as opposed to the standard, shorter “tourist” tour) of Upper Antelope gets you two hours in the canyon—one hour to photograph the beams in the company hundreds of oblivious tourists and competing, desperate photographers, and a second hour once the canyon has emptied, when it’s possible to walk its one hundred or so yards in relative peace and appreciate the qualities that make Antelope Canyon special. As cool as the light shafts are, it’s this quiet hour that I’ve come to enjoy most, both as a photographer and as a lover of all things natural. Without the shafts hypnotic pull, I’m free to appreciate light’s interaction with Mother Nature’s handiwork. Layered sandstone carved by centuries of sudden, violent flash floods separated by months of arid heat. The floods have scoured the hard walls smooth, crafted narrow twists and broad rooms, and finished the walls with multifaceted curves and lines that reflect sunlight in all angles like a house of mirrors. Each ray of light entering from the extremely narrow opening at the ceiling is reflected at least once, and usually many times before reaching its viewer’s eyes (or camera). Shaded sections create dark frames for the illuminated sections that seem to glow with their own light source. As the light shifts or the viewer moves, shapes appear—a face, a bear, a heart—and disappear to replaced by new shapes limited only by the viewer’s imagination. 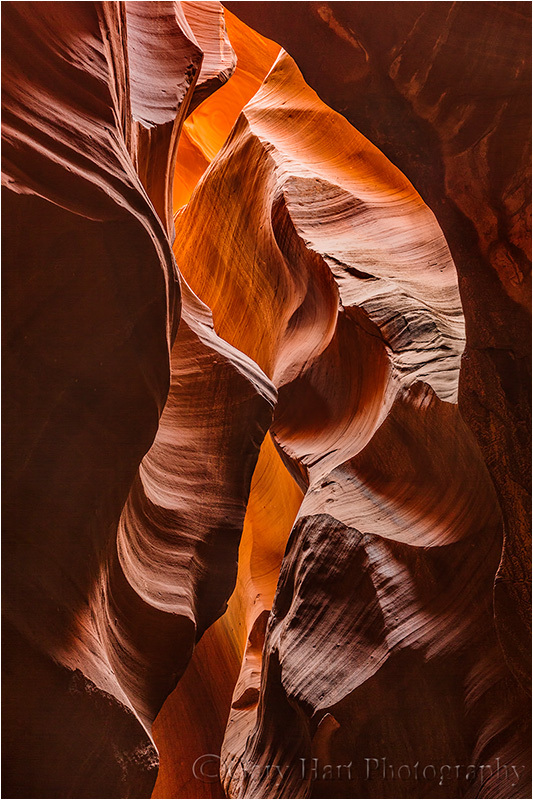 The bifurcated Antelope Canyon experience exposes an important reality: Dramatic light and color can blind viewers to a scene’s true beauty. While brilliant light and vivid sunsets grab your eyes in much the same way a rich dessert immediately satisfies your taste buds, we can’t live forever on this visual dessert. The images that sustain, the ones that draw us back and hold our attention once we’re there, are more often the subtle explorations of indirect light that allow us to make our own discoveries. I have gotten great shots in Lower Antelope Canyon. and without the crowds. I am able to wander as I please, up and down the canyon. A hint: When you get to the end where the ladder goes up to take you out, squeeze by the ladder and go further. There are some great shots there before you get to the drop off. Yeah, John, Lower Antelope Canyon is a completely different experience than Upper Antelope. What it lacks in dramatic light beams it more than makes up for with its graceful curves and lines. Lower Antelope is much tighter and steeper, but the lack of crowds make it a wonderful place to photograph. Inspiring natural beauty. Fantastic images, Gary. Thank you! Thanks for visiting, Jane. And for your kind words.